A subwoofer plays a major role in your home theater experience. Being in a movie theater allows you to marvel not only at the pictures and their quality projected on the screen, but also on the sounds that they produce. The sound is a deep bass, which you can actually feel. It shakes you up, completing the entire experience. The subwoofer, which is a specialized speaker, is actually responsible for that specific experience. Requires an external amplifier to power it up. In this case the amp or receiver should be capable of providing sufficient power to maintain the bass effects in the subwoofer without the risk of draining it. Self-contained amp units or speakers wherein the amp and the subwoofer have matching characteristics. It only requires a line output from the receiver, taking too much power load from the receiver or amp while allowing it to provide power to tweeters and mid-range easily. Makes use of a mounted speaker. It works by radiating sounds from the front or side of the enclosure. ​You can also choose from wired, wireless, and down-firing subwoofers. Your choice, though, should perfectly fit your budget. What to Consider in Buying the Best Budget Subwoofer? Note that subwoofers come in various sizes. You can find cube-shaped ones. They are the more compact choices that are only around 8-12 inches. There are also rectangular shaped ones. They are bigger, reaching up to 18 inches. These are ideal if you want to install one in a large room so it can produce rich sounds. ​Your chosen size should complement with the room. Fortunately, it’s now possible for you to find compact and small subwoofers that can already produce powerful sounds. These are good choices if you want to invest in a compact and small one, which does not take a lot of space. A subwoofer’s power/wattage can tell you exactly the amount of power it can produce, as well as the possible sound output. If you’re looking for the best budget subwoofer that you can install in your home, then one with around 100-150 watts is already a good choice. It’s enough for a small or medium-sized room. If you want a larger one with more power, though, then you can go for those that have up to 250 watts of power. The design of the subwoofer should also contribute to your decision. Note that different designs also provide different functionalities and features. For instance, you can go for the ported sub design if you want to make use of free outflow and inflow of air, which can make it more airtight. For low frequency responses while still having high cutoff, the sealed box is ideal. There is also what we call the bandpass design, which combines the functions and features of both designs, providing a better bass output. You have to know exactly the specific material used in constructing the box. Assess their quality and nature. Note that each material is capable of bringing out a distinct sound quality. One of the best materials for the subwoofer is the fiberglass. Aside from being flexible enough that it accommodates various styles and shapes of boxes, it can also produce exceptional sound quality. 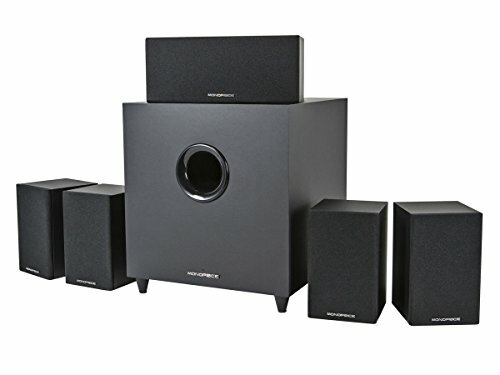 Nothing can beat this home theater system, which also comes with a high-quality subwoofer, from Monoprice in terms of aesthetics and price. It looks good, produces great sound, comes in a compact size and is offered at a very reasonable price. One thing that you’ll love about this system is that it features four satellite speakers. ​It also boasts of its single center speaker, which comes with a ¾-inch dome tweeter made of aluminum and a 3-inch mid-range driver made of polypropylene. Fortunately, it comes at a compact size while also boasting of its light weight, so mounting it almost anywhere is possible. It also takes pride of its 100-watt power. Such power is already enough to bring life to your movie soundtracks, favorite music, as well as any other audio files. Still, it’s a budget-friendly choice if you’re in search of the best budget subwoofer. It produces an incredible sound whether you’re planning to use it for music and movies. However, take note that it is more suitable for movie listening. It can also resist scuff marks and fingerprint impressions that are the usual problems in speakers that have a glossy black finish. 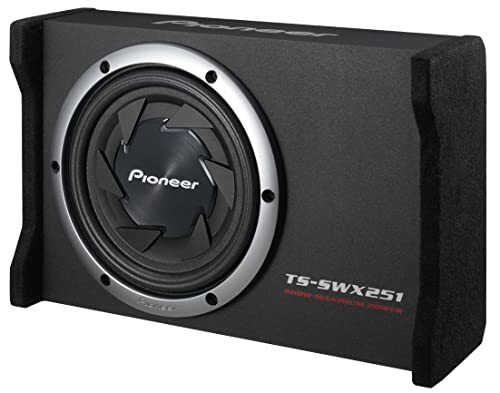 Pioneer's TS-SWX251 is one of the best budget subwoofer options, especially for those with compact spaces. It is the ultimate space-saving solution for those with limited rooms particularly vehicles that need a subwoofer. It is a rugged enclosure, which already features a shallow-mount sub. The fact that it has a compact size and design makes it possible for you to fit it anywhere. This makes it ideal to install behind a pick-up seat, under rear seats or in a mini-van cargo area. Still, it’s a good buy since it is budget-friendly. Despite its low price, it still has almost all the features and functionalities you need from a subwoofer. 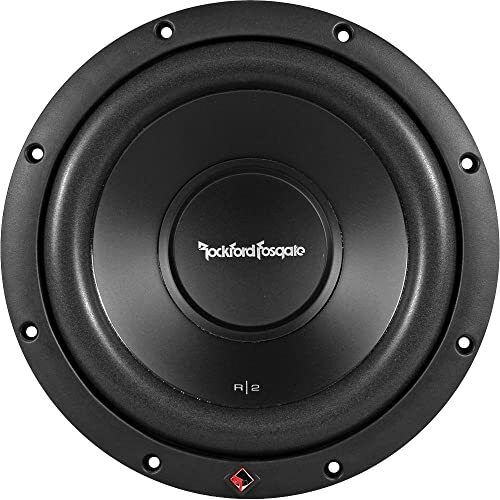 One thing that you’ll instantly love about this subwoofer from Rockford Fosgate is its ability to deliver strong bass while also being built to last. It works well for your car. It features a mica-injected polypropylene cone, which produces fat and deep notes. The tinsel leads carrying the signal directly into the voice coils are also stitched directly into the cone. This further improves its durability as this ensures that it can deliver a reliable and consistent performance despite heavy use. ​The subwoofer also features a stamped solid steel frame, which comes with venting, allowing it to continue running cool. Another distinctive quality of this subwoofer is its parabolic cone design, which promotes a solid bass reproduction. The fact that it has a straightforward mechanical design also increases its chances of delivering a solid performance for many years. 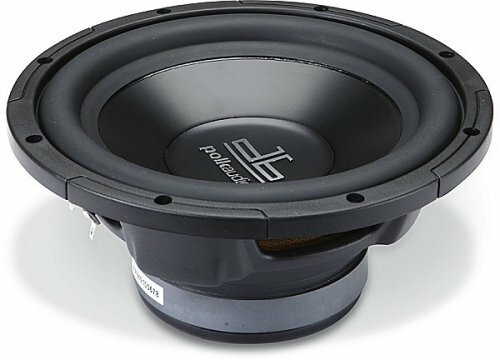 This subwoofer from Rockford Fosgate is indeed worthwhile to check out. With its low price plus the plenty of valuable features installed into the unit, you have an assurance that you’ll be a hundred percent satisfied with it. It is also capable of handling power under continuous demand without damaging the voice coils. This subwoofer from Polk Audio is worthwhile to include in your list of options if what you’re searching for is the best budget subwoofer. It’s reasonably priced, allowing you to take a hold of a high-quality subwoofer without ruining your budget. It is also a combination of high-tech materials and laser-optimized motor structure, thereby resulting to a powerful and smooth bass response. ​One great advantage of this subwoofer is that it is built sturdily. It is made in such a way that it can withstand the possible damages caused by too much exposure to the sun, salt and water. This functionality makes it ideal for use on all types of boats. In fact, it works very well as a marine dual-voice coil sub speaker. ​In addition, it features a dynamic balance polymer composite cone around eight inches. It also features a santoprene surround, making it impervious to extreme elements in temperature and humidity. This allows it to serve you for quite a long time. The fact that it is marine certified, though, means that it is really solid and tough enough that it can resist even the toughest situations and environments. That said, it is really capable of providing you real value for your money. Investing in this subwoofer will never cause regrets as it is low-priced plus it has almost everything you need to enjoy the unit. With this subwoofer, you’ll have the chance to enjoy your favorite sports and movies in your home theater. One nice thing about this device is that it is only around a cubic foot. It also features a stylish design while also producing impressive sounds when you’re watching your favorite movies or listening to your favorite music. Such features make it one of the best additions that you can make to your home theater. ​In addition, you will fall in love with its elegant and refined black ash finish. Another nice feature is the 300-watt and high current amp, effortlessly providing power to this subwoofer and promoting a more dynamic and low-frequency effect. Its 8-inch woofer even makes use of an excursion cone, which is long enough that it provides an accurate and deep response. 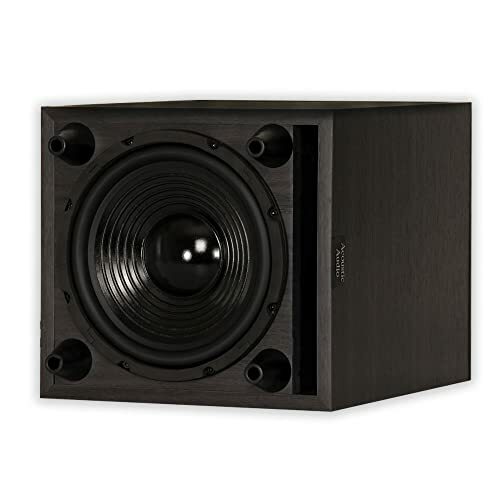 The indicated con, however, is just a minor flaw, and it is not that noticeable considering the many features that this down-firing powered subwoofer from Acoustic Audio offers. The best budget subwoofer should give you the kind of experience that you wish to achieve from your home theater. It would be best to consult a number of product reviews so you’ll know exactly which one obtained a higher level of satisfaction from users. It’s also advisable to determine what you need from a budget subwoofer first to increase your chances of choosing one, which satisfies that need.